President Ronald J. Daniels speaks at the Rising to the Challenge campaign close event on Oct. 11. 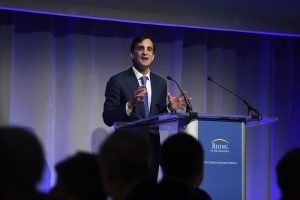 On Oct. 11, hundreds of Johns Hopkins faculty, staff, students, and friends joined President Ronald J. Daniels to celebrate the close of the Rising to the Challenge campaign. During the eight-and-a-half-year effort, more than 279,000 donors helped to raise more than $6 billion, enabling Hopkins people to pursue discovery, push boundaries, and deliver real-world results for the benefit of humankind. Learn more about how the Rising to the Challenge campaign is making a tangible difference from Homewood to East Baltimore and around the world by visiting our new Impact site today. Read more about the Rising to the Challenge campaign close on The Hub.